Katharine Bear Tur (born October 26, 1983) is an American author and broadcast journalist working as correspondent for NBC News. Tur is an anchor for MSNBC Live and has reported for the NBC news platforms Early Today, Today, NBC Nightly News, Meet the Press, WNBC-TV, MSNBC, and The Weather Channel. Tur was the [NBC's] embedded reporter for the Donald Trump presidential campaign. She was responsible for informing the Trump campaign about the Access Hollywood tape that NBC possessed. Several times during his campaign rallies, Trump singled out Tur in his criticism of the press. At an event in Florida, Tur was booed by Trump supporters and, according to other journalists, was subjected to verbal harassment. According to Trump campaign manager Kellyanne Conway, "[Trump] didn't mean it in any malicious way", and he did not want anyone to attack or harass her. 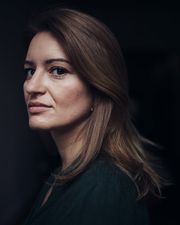 Katy Tur is currently considered a "single author." If one or more works are by a distinct, homonymous authors, go ahead and split the author. Katy Tur is composed of 2 names. You can examine and separate out names.